Uta Pütz lives in Cologne. Her work can be seen each year in many exhibitions, especially in South Germany and in Switzerland. The Atelier Mondial scholarship for New Delhi enabled her to spend six months in India. She lived and worked for three months on the grounds of the Sanskriti Foundation, which always has several international artists in residence. After that, she lived in an apartment in the middle of the city as part of the program. Pütz says her time in New Delhi was very productive and rewarding. Over her artistic career, she received the AIR scholarship for the city of Chemnitz three times, the IAAB scholarship for Helsinki, as well as the Rhône-Alpes scholarship for Valence and the Academy Prize for the city of Freiburg. What did a normal day during your stay in India look like? Impression of Delhi | Photo: © Uta Pütz For the first three months, I was a guest of the Sanskriti Foundation, which accommoda- tes up to 20 artists from around the world in 10 little houses in New Delhi. Our days began with a communal breakfast, to which we were called by the ringing of a gong. 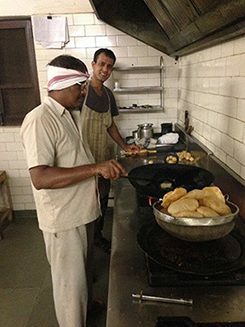 Several cooks (see above) conjured up sometimes very spicy, Indian breakfast foods in the kitchen, but there was also toast and cornflakes. During the day, I would wander through the city, especially in the labyrinth of alleyways in Delhi’s old town. I also collected material there, which I later used to create photographic works in the studio. I’d read a lot about India before arriving, but I didn’t really touch and Indian literature once I got here. I wanted the country to have a pure effect on me. In the evening, everyone came together again for dinner. We hear about India from when we were children onwards. Despite this, how were you unprepared when you got here? Impression of Delhi | Photo: © Uta Pütz Mostly the sensory impressions I got here. Everything happens at the same time, and I was already overwhelmed by the visual input from the beginning. There are so many details. In this snapshot, taken from a roof in the old town, you see how peoples’ lives play out in a few square meters behind the spice market. As an artist, you look at the world in a special way. What did you think was beautiful in India? What was ugly? Impression of Delhi | Photo: © Uta Pütz I didn’t find anything ugly in an aesthetic sense. More like interesting or less interesting. 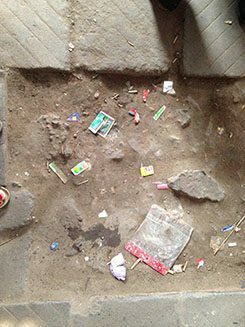 Since I also work with a lot of found objects, the streets littered with trash were a true treasure trove for me. Sometimes it was a bit disgusting, but I got used to it. What I found ugly were more political realities that seeped into me bit by bit. Keywords: The caste system, lack of equal rights, environmental destruction, oppression of minorities … I primarily found out about these wrongs from Indian artists that I met during my residency. Many of them were disgusted about things that are happening in their country. Did the residency have a concrete outcome for you, did you bring an artwork back home? I was also fascinated by the cow chips as an abstract object. It’s the fuel with which half of India cooks and heats: Cow droppings with straw formed into cakes. I cast one of them in brass. The head of the studio asked me precisely how I thought it would come out with a stern face. All in all, I brought a lot of stimuli and ideas back home with me, which I will realize in the coming months. Which interpersonal encounters will remain in your memory? Impression of Delhi | Photo: © Uta Pütz Definitely some, both with Indians and also with people from different parts of the world. Here for example, I was in the countryside near Orissa with a driver. 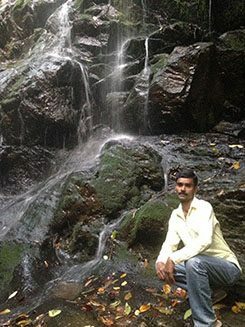 He really wanted to be photographed in front of this waterfall nd so he gave me this smart pose. India isn’t an easy country – did you have to brush aside your boundaries or overcome them? Not really. I had to adjust sometimes. For example, I was the guest of a family in Orissa for several days. They served food on the round, without silverware. So then you learn how to eat with your hands. By the way, I never got into uncomfortable or dangerous situations. Did you have anything to do with India before? No never. I wanted to go to India to see how the unknown would influence me, and more importantly, my art. Atelier Mondial, who gave you the residency, just opened a group show from this year’s recipients. The exhibition is called “Where is the beef?” What’s behind that? I was in the exhibition and the title was unideal for India – too close to the cliché. At times you had to fend for yourself in Delhi – was that an adventure? I had to fend for myself for the last three months. I was very happy that I knew by then where and how to buy food. If it had been in the beginning, I probably would have starved, since in India there are no supermarkets where you can buy everything you need. Lots of groceries are sold by venders that move around, like the vegetable vender in this picture. He makes his way along the streets and you have to keep an eye out for when he’s around. Luckily there are snack stands on every corner that have delicious things.